IBM Digital Analytics is a complete, cloud-based digital analytics engine that gathers digital analytics for optimizing your web presence, marketing ROI, and converting visitors into loyal customers. With IBM Digital Analytics, Pereion provides the customer behavior insight you need to transform your real-time analytics into automated digital marketing actions, optimizing your web, mobile, and social channels. Enterprise Analytics: Executive-ready reporting, segmentation, deduplication, and simplified analytics across all sites based on user’s needs to analyze customer behavior. Lifecycle: Increases customer value with industry-unique analytics, marketing automation, and customer milestone reporting based on where individuals are in the buying cycle. Social Analytics: Monitors and measures social ROI to understand brand engagement, brand monitoring, and the social campaigns that are providing the best results. Multichannel Analytics: Offline data and business insights to enhance your digital analytics, optimize marketing campaigns, and extend your focus across all channels. Impression Attribution: Out-of-the-box reporting, comprehensive tracking, and a global view of off-site interactions to analyze online impressions. LIVEmail: Out-of-the-box integration that uses customer insights to deliver targeted, automated email campaigns that will map email relevancy content and increase your conversion rate. AdTarget: Out-of-the-box, targeted, display ad network integration that uses customer insights to extend your reach and increase your customer acquisition. Search Marketing: Search bid management solution to enhance your PPC campaigns, automate bids, and maintain control of your analytics that will optimize your search marketing strategies. Intelligent Offer: Dynamic, product recommendation engine that provides personalized offers across all your channels to increase your sales. 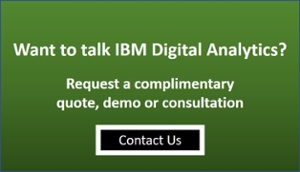 Want to talk to us about IBM Digital Analytics? Please contact us by clicking on the Contact Us button on the right. To learn more, please visit the IBM Digital Analytics page.